The American avant-garde played an important role in the creation of a modernist visual culture on both sides of the Atlantic in the first decades of the twentieth century. Many American artists resided in Paris during these years. There they encountered firsthand the innovations of their contemporaries Henri Matisse and Pablo Picasso, whose radical experiments in color and form epitomized modernism in Europe. In the United States modernism initially found its strongest expression in the eclectic activities of the group of artists, writers, and critics who gathered around the photographer Alfred Stieglitz at his gallery "291" in New York. The full scope of the modernist movement became evident in 1913 with The International Exhibition of Modern Art, known as the Armory Show. This display of well over a thousand American and European paintings and sculptures introduced the American public to cubism, abstraction, and other recent artistic developments. Following the Armory Show, the Frenchman Marcel Duchamp settled in New York in 1915, proclaiming "Europe is finished. . . America is the country of the art of the future." Duchamp embraced the machine culture of his new home and raised provocative questions about how art should be defined by taking everyday, commercially manufactured objects and exhibiting them as simply "readymades." The twenty works by nineteen artists that form the Shein Collection offer a concise, nuanced account of the first American avant-garde. The various shifting, intersecting alliances of the early modernist period are represented, including the painters associated with Stieglitz such as Arthur Dove, Marsden Hartley, John Marin, and Georgia O'Keeffe; practitioners of New York Dada such as Duchamp and Man Ray; the synchromists or color painters, Patrick Henry Bruce and Stanton Macdonald-Wright; precisionists such as Charles Demuth, Morton Schamberg, and Charles Sheeler; and the transatlantic modernists, Bruce, Duchamp, Man Ray, and John Storrs. Looking at the history of early American modernism through the lens of the Shein Collection offers a timely opportunity to consider the contributions made by American artists during the advent of modernism a century ago. In the years leading up to his departure for Paris in 1921, Man Ray was an active participant in the New York salon of Walter and Louise Arensberg and, along with Marcel Duchamp, a founding member of the Societé Anonyme and a key figure in the development of New York Dada. In Legend, Man Ray experiments with illusions of depth and flatness. He suggests the broad patches of color are like the sections of an umbrella, "where one takes off the tip and…turns it around on its curve," rendering three dimensions as two. Man Ray further emphasizes the flat picture plane through the playful inclusion of the title plaque—or legend—at the bottom. Beginning in 1915 Schamberg turned to mechanical subjects, often abstracting a fragment of a machine and eliminating its background so that its function became uncertain. Painting VI was long thought to represent a camera—the white disk at upper left is reminiscent of a flash pan from the era. Instead, it depicts part of a hosiery-manufacturing apparatus owned by the artist's brother-in-law, the upper left circle operating as a spool for the ribbon of fabric that threads through the machine. Schamberg's burgeoning role in the New York Dada movement was cut short in 1918 when he succumbed to the flu pandemic. In 1913 Macdonald-Wright, a young American artist living in Paris, boldly declared a new artistic style, which he (along with fellow American Morgan Russell) called synchromism. Abstract, colorful, and rhythmic, the style found parallels with music. In the artist's words, "I strive to divest my art of all anecdote and illustration and to purify it to the point where the emotions of the spectator will be wholly aesthetic, as when listening to good music." Still-Life Synchromy was painted in 1917, after Macdonald-Wright had returned to the States. Its fractured composition disguises subject matter, though careful inspection reveals a pitcher on the right, an apple that seems to float above, and perhaps a figure in the background. Living in Paris from 1904 to 1936, Bruce associated with the French avant-garde. He was close to Henri Matisse and in 1908 became a founding member of Matisse's art academy in Paris. Like the French painter, Bruce afforded color an essential role in his art, but he was also drawn to the still-life paintings of Paul Cézanne, which reduce natural forms to their underlying geometric structure. In this painting we detect a pair of cylindrical glasses and stacked rounds of cheese on a skewed tabletop. Some of the forms may represent pieces of wood from antique furniture that Bruce, who was also an antiques dealer, would have possessed. While living in Paris from 1905 to 1909, Weber befriended Pablo Picasso and witnessed firsthand the development of cubism. When the American artist returned home he brought with him the first painting by Picasso to enter the United States. Weber's own painting adopted a cubist style, as seen in the fractured planes, masklike features, and subdued palette of The Fisherman. Too abstract to bear a true likeness, the portrait nevertheless suggests the artist, an avid fisherman, who smoked a pipe and wore a vest and jacket much like those depicted here. Demuth fused industrial style and subject matter, depicting the Lukens Steel complex with clear-cut lines and contained color—a style known as precisionism. The smokestacks and buildings are as crisply rendered as an architectural drawing, and even the billows of smoke are carefully delineated. Demuth's painting, however, does not faithfully document the Lukens factory; one building is fancifully composed of stacked trapezoids, and rays of steely gray shoot across the sky in a decorative arrangement. Critics admired Demuth's ability to find beauty in industrialized America. As Henry McBride noted, "He makes of it a thing that seems to glorify a subject that the rest of us have been taught to consider ugly." 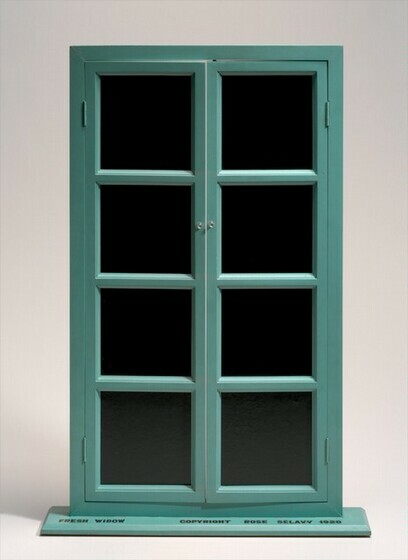 Describing the manufacture of this sculpture, Duchamp said, "This small model of a French window was made by a carpenter in New York in 1920. To complete it I replaced the glass panes by panes made of leather, which I insisted should be shined everyday like shoes. French Window was called Fresh Widow, an obvious enough pun." Indeed, the pun would have been especially pertinent in 1920, in the immediate aftermath of World War I. Signed by Duchamp's female alter ego, Rose Sélavy (a pun on eros c'est la vie, or “eros, that's life”), Fresh Widow offers a pointed critique of how art is traditionally perceived and understood. By blocking the window's transparency, Duchamp contradicts the notion of paintings as windows onto other worlds—an idea broadly accepted since the Renaissance. 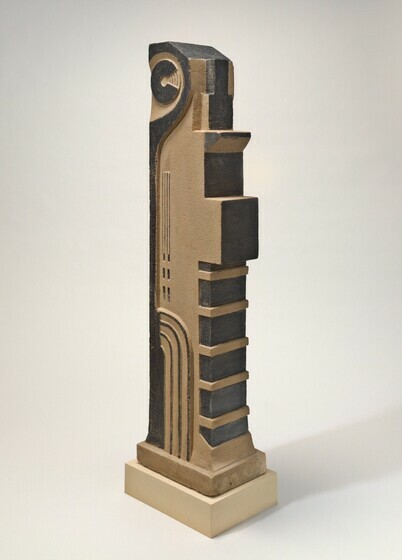 This pair of sculptures, each tower incorporating a contemporary luxury automobile turned on its end, transforms a functional, industrial form into an architectural adornment or monument—a totem to American technology. Storrs, a Chicago native and the son of an architect, was knowledgeable about modernist buildings and here embraces the hallmarks of the art deco style: elegant geometry, graphic use of black, and fascination with technology. In warm weather, O'Keeffe left New York City for the more peaceful surroundings of Lake George in upstate New York, where she stayed with Alfred Stieglitz at his family's summer home. The natural environs of the retreat provided both artists with rich subject matter. In Dark Iris No. 2, O'Keeffe plunges deep into the center of a black iris, presenting such an unusual and narrow focus that the painting verges on abstraction. The flower also may be seen as embodying sexual imagery, clouds, or even (turned on its side) the Lake George mountains and water. O'Keeffe alluded to the transformational power of art, "when you take a flower in your hand and really look at it, it's your world for the moment. I want to give that world to someone else." In 1912 Alfred Stieglitz mounted a one-man exhibition of Dove's work at his gallery 291—the first public exhibition of abstract art by an American. 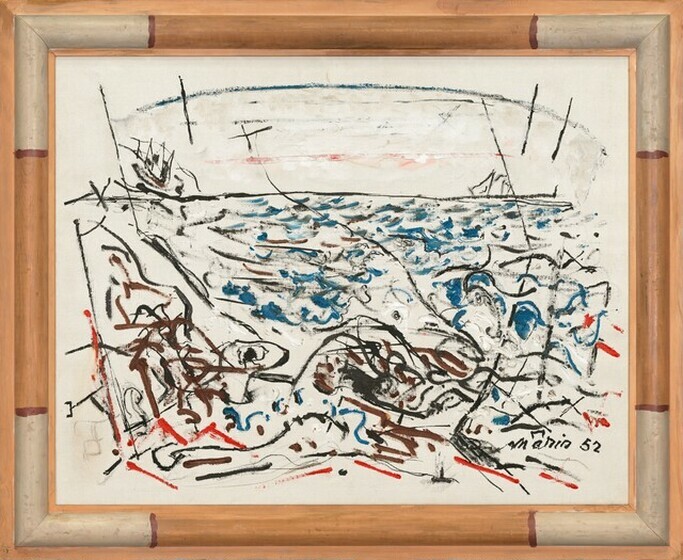 Dove's abstractions were often rooted in nature and became increasingly bold in the latter part of his career, as seen in Sunrise I. Painted at his family's property in western New York, the sunlike orb appears to glow over a horizon, yet the accompanying forms preclude such a literal reading. Some have seen this as a depiction of the moment of creation; it may hint at the artist's interest in theosophy, which finds unity in all nature. Marin, known primarily for his work in watercolor, such as his 1922 Sunset, devoted much of his late career to working in oils. Normally considered a less fluid medium, oil paints in Marin's hands became delicate and free-flowing—an innovative approach that inspired the younger generation of abstract expressionist painters. The Written Sea, with its flurry of calligraphic brushstrokes, evokes the perpetual movement of the windswept Maine seascape. "The Sea…wants to be horizontal," explained the artist, "but then the horizontals begin to play, to move. Sympathetic lines turn up all over the canvas, a diagonal here, a patch of color there, all related to each other, all echoes of each other, all living together, all adding up to a total shape, but always adding up to life." Sheeler's works, with their particular blend of quintessentially American subjects and modern style, often were described as both familiar and abstract. That is especially true in this depiction of a New England barn—his last variation on a theme that had occupied him for decades. The composition, rendered with broad, flat application of color, is based on photomontages the artist made of barns in which he layered negatives to create complex arrangements of superimposed architectural forms. When the Philadelphia-born Davis exhibited at the Armory Show in 1913 he was one of the youngest participants. Beginning in the 1920s he brought the graphic sensibility and restricted palette of commercial advertising into his art. These qualities are evident in one of the artist's last paintings, Unfinished Business, in which Davis engages viewers in a bit of visual word play. An assortment of Xs and Os suggests tic-tac-toe players that have slipped off their grid. In the lower right quadrant, "Edy" is rendered in script, and along the right edge "PAD" is printed. The former is likely a variation of the sequence "Ideas—Eyedas—Eyedeas" that Davis recorded in one of his sketchbooks, also known as sketch-pads or "pads." Combined with the letters "NO" at left we may surmise that Davis was referring to the American poet William Carlos Williams' famous axiom, "No ideas but in things."